Ever since I one dropped my (previous) phone on concrete and smashed the screen to bits, I vowed to never go without a phone case again. As much as I love the sleekness of not having a case on my phone, and granted, screens can still crack even with a case on, I'm in the camp of some protection is better than none. And while I want to protect my phone as best I can, I'm just not a fan of huge, bulky cases. I also think it's fun to personalize your phone with a cute/pretty/loud/stylish case. When CaseApp reached out to me asking me to design my own custom phone case and laptop skin, I was pretty pumped! At the time, I was currently rocking a clear phone case and I was ready to change it up. The hardest part about this whole process was deciding on a design. CaseApp has a ton of pre-designed phone cases and laptop/tablet skins, to which you can add font or your own photos/designs. Or you can completely design your own case from scratch. The options are pretty endless! I went back and forth between different design options, but ultimately, this marble one kept catching my eye. 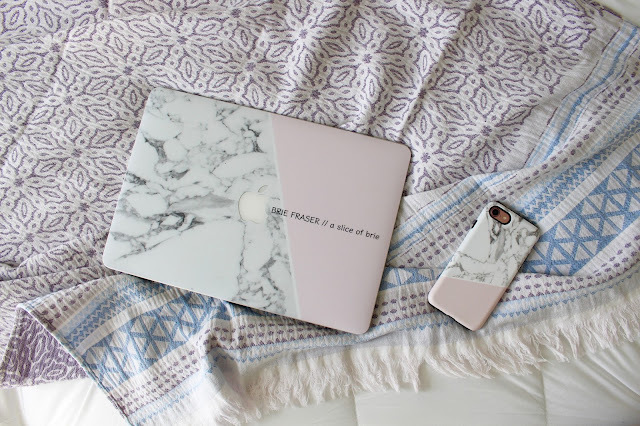 I loved the pop of pastel and I decided that this time around, I wanted a sleek, yet eye-catching phone case. CaseApp offers phone cases in two different styles: a "regular" slim-fitting one, which offers light protection from bumps, scratches and shocks, or a "tough" case, which offers protection against more aggressive falls and bumps. 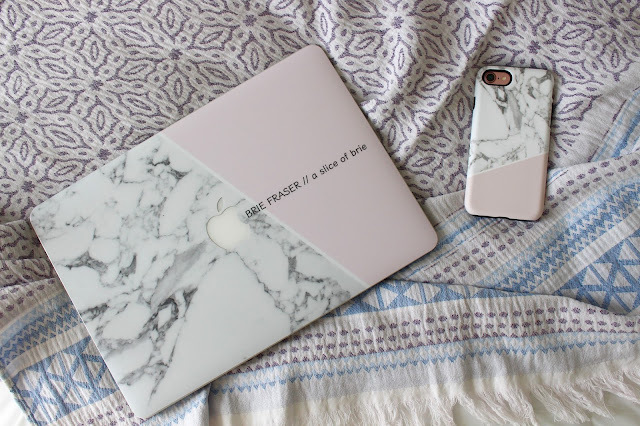 The cases also come in either matte or high gloss finish. I opted for the tough case in a matte finish, and I'm so glad I did. It's not nearly as bulky as I feared it might be, and the quality is top-notch. The matte finish makes the phone less slippery, which I really appreciate when texting one handed, or transferring my phone into and out of my purse or diaper bag. 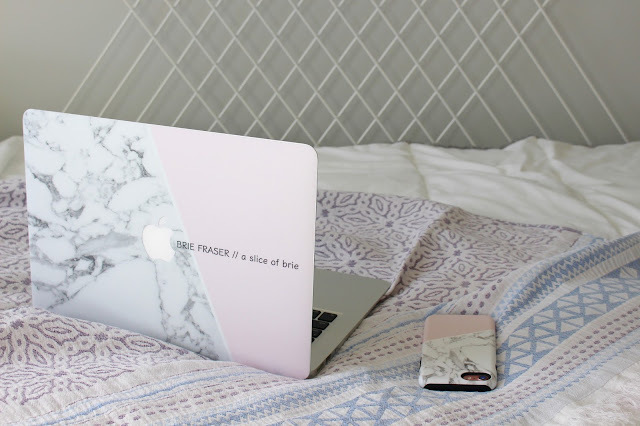 For my MacBook skin, I matched it to my phone case, but I added some text to customize it. But I've saved the best part for last! I'm giving away to one lucky person, their choice of either a custom phone case or custom laptop/tablet skin! Head over to my Instagram page to enter! 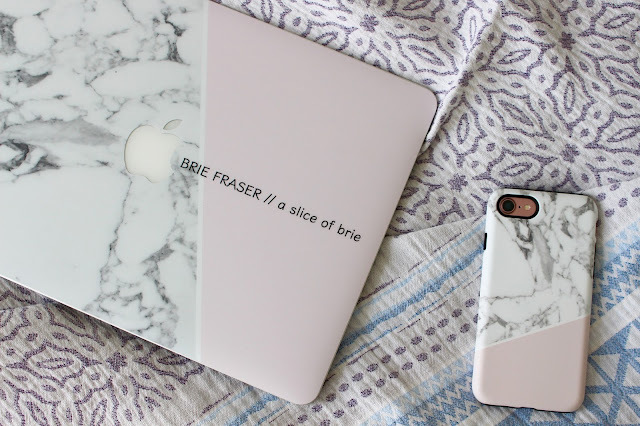 In the meantime, you can use code SLICEOFBRIE20 to receive 20% off your order on CaseApp. Code is good until March 31/17 so don't wait! but as always, all thoughts and reviews expressed are my own.